Rocky Balboa. Susan "I Dreamed a Dream" Boyle. The 1980 U.S. Men’s Olympic Hockey Team. What I'm trying to say is ... no one can resist an underdog. Small businesses with limited marketing budgets have always been at a disadvantage against big-name competitors. When you’re the shop on the corner, good luck competing with corporations with quarterly marketing budgets larger than your entire annual revenue. At least, that’s how the story used to go. But watch out Goliath -- David just got a slingshot.Inbound marketing helps level the playing field for marketers with less budget, and more brains. To show you just how effective inbound can be, we've identified some companies that are crushing it against larger competitors. You know, for a little inspiration. So grab your pom-poms and get ready to cheer on some underdog companies dominating giant competitors with inbound marketing. Husband-and-wife team Chris and Sharon Pastore of Havertown, PA founded Main Line Family Law Center, LLC in 2011 to provide painless legal assistance for couples going through separation and divorce. For clients, they summarize their goal as “restoring sanity and dignity to the divorce process.” The Pastores were a small business of only two people where the marketing and business management fell on Sharon’s shoulders. Divorce and separation can also be a very private process that clients would rather Google than ask a friend about. Sharon understood her clients’ desire for privacy, and focused her marketing on keyword strategy. She discovered people were searching “legal separation in PA” without seeing a lot of valuable content, so she started targeting that phrase and similar ones with blog content. The results paid off. Main Line Family Law reached a #1 rank for dozens of keywords, saw a 30% quarterly growth in web traffic, and because she used calls-to-action and landing pages to convert all that traffic, she saw a quarterly 30% lead growth, too. The wins didn’t stop there, either. When the Oprah Winfrey Network (Oprah, you guys!) was browsing for divorce and separation clients for a show, guess who came up on the search engine results page? Not a huge legal firm. Not Law.com, The New York Law Journal, or any other legal publications. Main Line Family Law came up. The Rodon Groupis a B2B third-generation family business that has manufactured small plastic parts and molds at a high volume since 1956. As one of the largest operation injection molders in the country and manufacturer of over 30 billion parts for K’NEX Brands (the famous toy construction brand), The Rodon Group hardly seems like an underdog. What gives? The Rodon Group now has to compete on a global scale, and U.S. manufacturing isn’t known for offering the best prices for high volume, small plastic parts in comparison to competitors in other countries. Many potential customers turn overseas before fully exploring the cost-effective options available in the U.S. 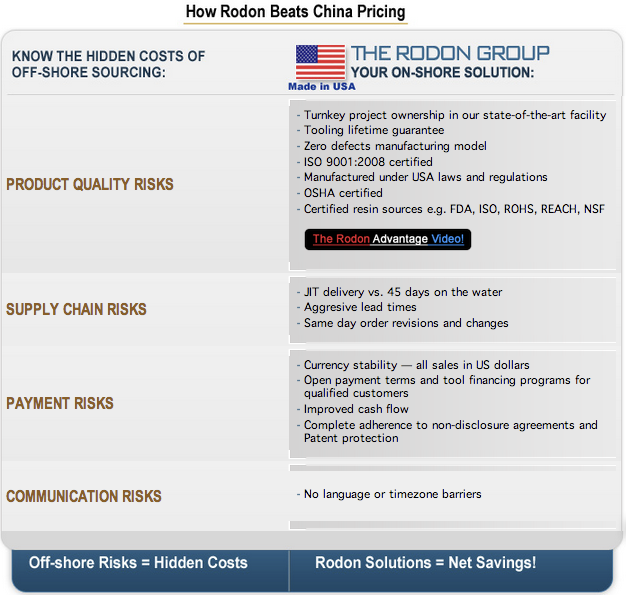 This approach not only addressed a concern The Rodon Group’s potential customers were facing, but something the entire country was worried about. 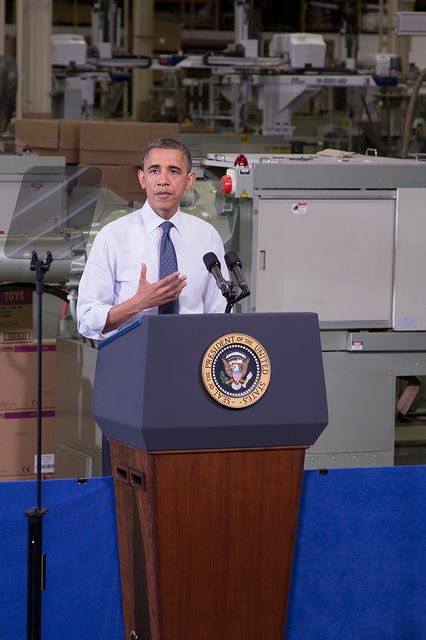 Their marketing messaging even earned the attention of President Obama, who personally flew to the plant in Hatfield, PA to deliver a speech. This wasn’t a campaign that The Rodon Group spent hundreds of thousands of dollars on. All they did was embrace inbound marketing by creating a content-based campaign that addressed customer concerns. It earned them an in-person endorsement for the President of the United States, not to mention coverage from top tier publications. Talk about powerful. Jackson Coffee Company is a Michigan-based coffee shop that describes their mission as simply “roasting and brewing really great coffee” since September 2006. The business has three locations in Jackson, MI, but no chains outside the city as of now. What makes Jackson Coffee Company so special? They have consistently won “Best Coffee House” awards in all the years from 2007-2012 against giants such as Starbucks, Dunkin' Donuts, and McCafe as well as five other independent coffee houses. Even better? They report never having to explicitly ask their customers to vote. Sure, they focus on great coffee (read more about their coffee quality assurance methods, or the “J” way here), but Jackson Coffee Company emphasized email marketing to help drum up support. And instead of spamming the same list over and over with interruptive messaging, Jackson Coffee followed the make love, not spam email methodology by keeping multiple, separate lists for things like newsletters, or birthday promotions. Robert Ernst, the company’s social media manager, explains that keeping separate lists makes it easy to email customers at the frequency they prefer. While some customers prefer only an annual update for their birthday club cup of coffee, for instance, others want a more frequent update. To learn more about how to do email marketing right -- who knows, maybe it'll be what you need to reign supreme over a big industry competitor of your own -- check out our free ebook that teaches you how to optimize your email marketing for conversions. 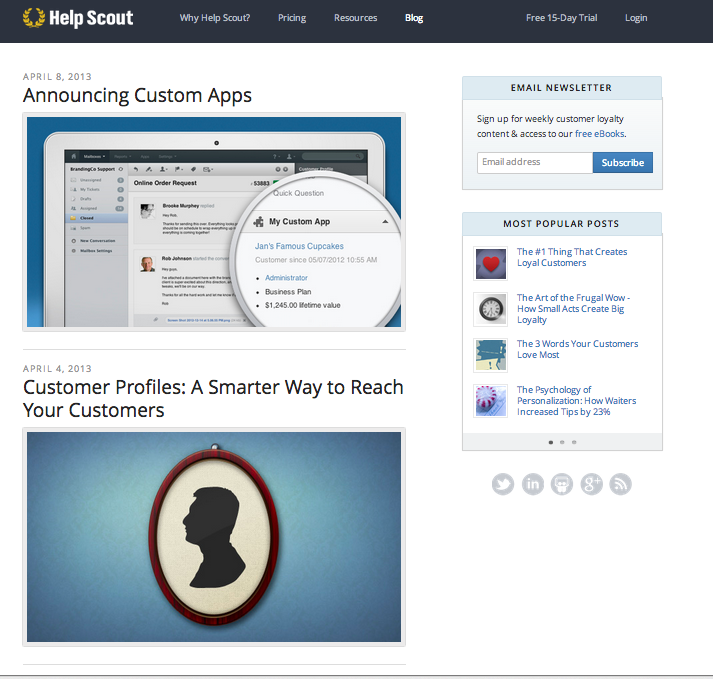 Help Scout is a B2B customer service software company founded in 2005 with seven full-time employees. While they started off in Nashville, they’re now our neighbors in Boston. Help Scout’s mission is focused on helping businesses deliver scalable, personal customer support. They take this mission so seriously that all of their job titles read “Customer Champion” -- even the co-founders. There are some big fish in Help Scout’s pond. 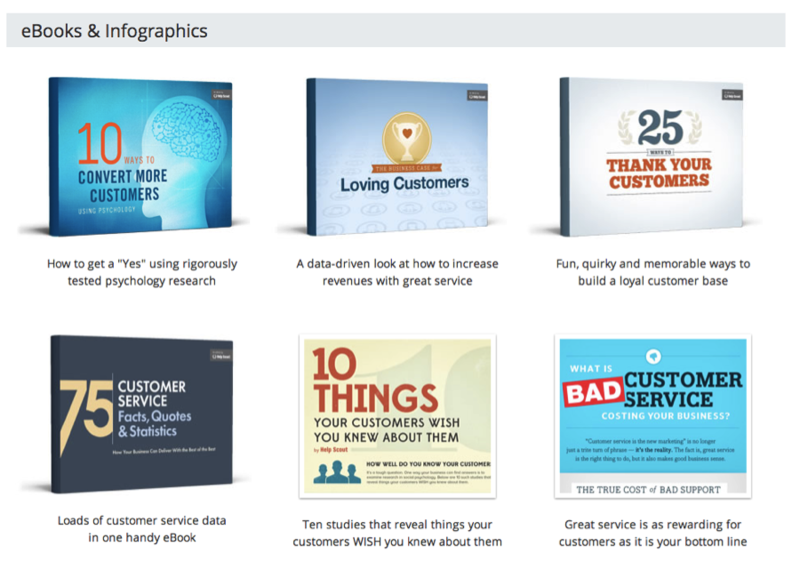 Heck, Zendesk has 25,000+ customers, including Disney -- the leaders in magical customer experiences. With less manpower and marketing budget dollars comparatively, how does Help Scout get the word out? With fantastic content, of course! Help Scout knows that content is the fuel that feeds the inbound marketing machine, and it shows with their beautiful and comprehensive content, both on their own website and externally through guest blogging. Not only does this content help them build authority with their audience, but it attracts more than enough leads to sustain a steady 10% month-over-month growth rate without breaking the bank on advertising. According to business co-founder Nick Francis, Help Scout experienced a 678% growth in leads from August 2012 to February 2013. Feel free to explore Help Scout's assets in a little more depth on your own, but I wanted to highlight two here for you -- check out their Resources center and their company blog below -- before we go into their guest blogging. Alright, now a quick word on how Help Scout's guest blogging program has helped them edge out bigger industry competitors. They're active guest bloggers, reaching out to companies like Buffer (efficiency hack blog) to create content around simple ways to improve customer service. This content strategy exposes Help Scout to new audiences without breaking the bank, and further cements their credibility in a space where they aren't the biggest provider. This content has helped them build trust with their audience, and as a result, they've seen a265% increase in unique visitors from August 2012 through February 2013. They also saw a 678% growth in leads collected. Close your eyes and imagine you’re on a dream vacation anywhere in the world you want to be. Where did you go? A café in Paris with fresh croissants? A tropical beach with your toes in the sand? Wherever you chose, I'm willing to bet many didn't jump right to Iceland. As nice as the country is, Iceland doesn’t naturally pop into people’s heads when they think vacation. Icelandic marketing agency Takk Takk, then, had a challenge -- to put a small island in the middle of the ocean on the map for tourists. 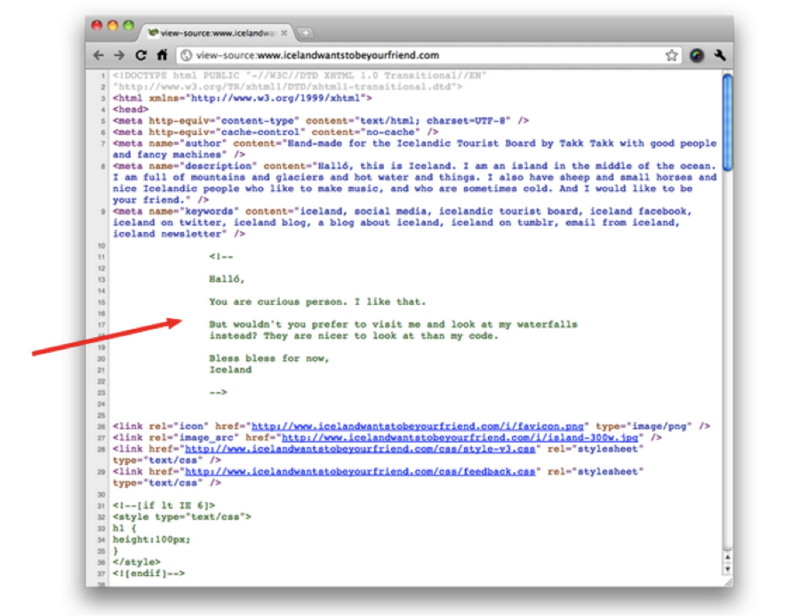 Enter the "Iceland Wants to Be Your Friend" campaign. The agency created a branded personality for the country of Iceland and kept it consistent across social and online platforms, too -- even their source code had a bit of personality! The results? The campaign started in 2009, and by 2012, tourist traffic at Iceland's Keflavik International Airport broke records, with 2.4 million passengers, approximately 1/4 of whom were foreign tourists. Keep in mind, this all happened after the 2008 banking crisis and a volcanic eruption in Iceland. Iceland also just received a 2013 ranking from the World Economic Forum as the world's most welcoming holiday destination, where part of the ranking relies on how welcome the population's attitude seems toward foreign visitors -- something embodied strongly in Takk Takk's campaign. 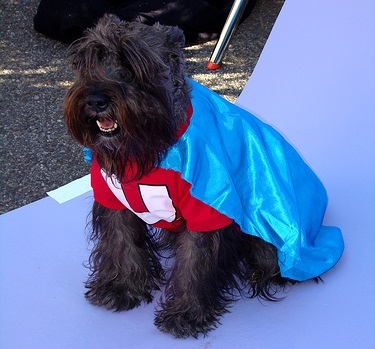 What's your favorite underdog marketing story? Are you using any specific inbound marketing techniques you use to get the edge on your competitors? Tell us your stories in the comments section! We'd love to hear them.